A substantial shift toward use of marine protected areas (MPAs) for conservation and fisheries management is currently underway. This shift to explicit spatial management presents new challenges and uncertainties for ecologists and resource managers. 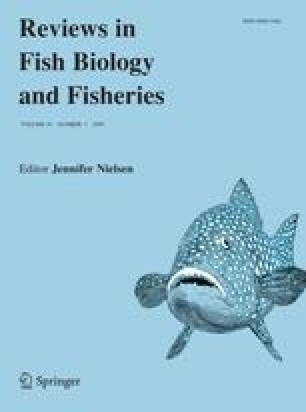 In particular, the potential for MPAs to change population sustainability, fishery yield, and ecosystem properties depends on the poorly understood consequences of three critical forms of connectivity over space: larval dispersal, juvenile and adult swimming, and movement of fishermen. Conventional fishery management describes the dynamics and current status of fish populations, with increasing recent emphasis on sustainability, often through reference points that reflect individual replacement. These compare lifetime egg production (LEP) to a critical replacement threshold (CRT) whose value is uncertain. Sustainability of spatially distributed populations also depends on individual replacement, but through all possible paths created by larval dispersal and LEP at each location. Model calculations of spatial replacement considering larval connectivity alone indicate sustainability and yield depend on species dispersal distance and the distribution of LEP created by species habitat distribution and fishing mortality. Adding MPAs creates areas with high LEP, increasing sustainability, but not necessarily yield. Generally, short distance dispersers will persist in almost all MPAs, while sustainability of long distance dispersers requires a specific density of MPAs along the coast. The value of that density also depends on the uncertain CRT, as well as fishing rate. MPAs can increase yield in areas with previously low LEP but for short distance dispersers, high yields will require many small MPAs. The paucity of information on larval dispersal distances, especially in cases with strong advection, renders these projections uncertain. Adding juvenile and adult movement to these calculations reduces LEP near the edges in MPAs, if movement is within a home-range, but more broadly over space if movement is diffusive. Adding movement of fishermen shifts effort on the basis of anticipated revenues and fishing costs, leading to lower LEP near ports, for example. Our evolving understanding of connectivity in spatial management could form the basis for a new, spatially oriented replacement reference point for sustainability, with associated new uncertainties. This manuscript is a product of an effort to integrate the science of marine protected areas and fisheries management, sponsored by NOAA Fisheries, Southwest Fisheries Science Center and the National Marine Protected Areas Center. We thank Lisa Wooninck and other working group participants for their guidance and feedback.